weltgewandt. 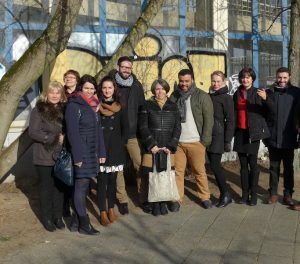 invited representatives from the partner organisations in Prague, Tartu and London to hold the kick-off meeting in Berlin. We got to know each other personally and planed the project activities and its results. Moreover, the group experienced playful ways of approaching to economic issues. 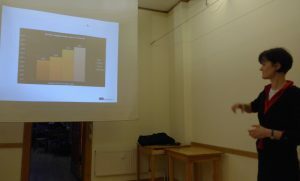 We also discussed interpretations referring to the current euro zone problems. The questions and considerations raised by the participants reflected perspectives against the background of the public debates in each partner’s society. We agreed that European challenges need to be analysed in a European, transnational dimension. 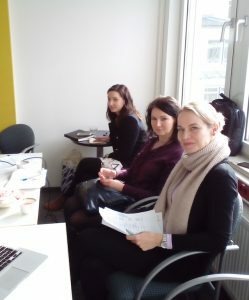 Further meetings take place in London (March 2017), Prague (June 2017), Tartu (November 2017) and Berlin (February 2018). During the project we hold two training / teaching activities in which we share our didactical skills related to economic issues. 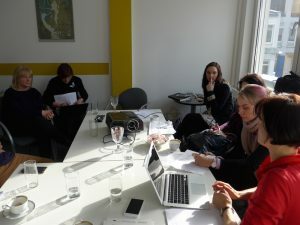 The first training (workshop) of 5 days took part in London in March 2017. We focused on a) work and the future of labour as well as b) money. 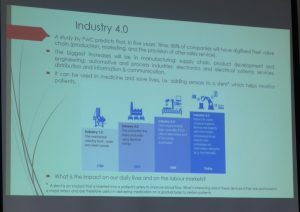 We started with a ‘classic’ power point introduction into labour markets and industry 4.0. This was combined with small exercises to demonstrate the division of work and what’s necessary to organise the production of goods. What participants learned was then implemented in a short movie production (stop motion animation). To do so, we have built small groups. The learners discussed and decided a sub-topic to be focused on. They developed a short story. Facilitated by a film maker expert, they then created a short animation movie. Thus, film making was used as a tool to come to a deeper understanding of some aspects of the theme and to experience own creativity and resources. Money is a complex issue. But history helps finding a path of understanding. Participants followed two lively lectures on the development of credit money and on the history of banknotes and paper currency. 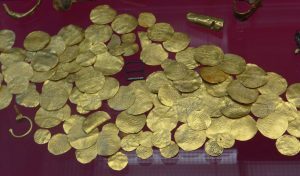 They discussed the ban on interest as a starting point of the modern credit money system. The other focus was given on the Bank of England and the reasons to found such an institution. Question raised what kind of ‘anchor’ should money have, gold, petrol, the amount of goods and services, labour? After these inputs all learners were invited to experience games and exercises which stimulate getting into theatre work. They then transformed their ‘new knowledge’, point of interests, or questions into ‘sculptures’ by ‘shaping’ the body of a colleague. This was part of the statue theatre, one of the theatre techniques developed by Augusto Boal („Theatre of the Oppressed“). The ‘sculptures’ were entitled and all its creators left the room. They came back as museum’s visitors who explained each other the ‘art objects’. Discussions came up on the issues which is one aim of this kind of theatre. The workshop participants then applied the method of sociometry in order to explore what is meant by the terms „stakeholder value“ and „shareholder value“. They „figured“ alternatively as an entrepreneur, a bank, a trade unionist, a component supplier (stakeholder value) or a wealthy person investing shareholdings, a broker at the stock exchange, an analyst of a rating agency, etc. (shareholder value). This helped to clarify the terms and to outline different frameworks of market economies which exist(ed). Understanding economic developments can also be arranged through debating a current and ‘hot’ macro-economic issue. We have chosen the politics of low interest rates by a Central Bank – sounds more neutral as two partners are not situated in a Euro country – and worked with newspaper theatre. Small groups read and discussed a newspaper article given by the facilitator. Learners then performed their interpretation. All these theatre approaches enabled a more deeper connection within the group and stimulated to common discussions. It was the combination of ‘old school’ knowledge learning and creating something by hand, heart and brain which made all the sessions rich! The market, what’s this? How to explain what people experience in everyday’s life? During the transnational project meeting in Prague on 23rd June 2017 partners discussed different interpretations of a market against the background of both the neo-classic approach and the model of the Economics of Conventions developed by French economists. Is the market something given which emerged through an evolution process? Or is it the result of a social processes, e.g. negotiations and conventions on quality, the introduction of new products and to ensure new markets? Or shall we imagine a mixture of both? Following these questions, we continued sharing knowledge on Economics and methods to make Economic Literacy an interesting matter for so-called disadvantaged learners. 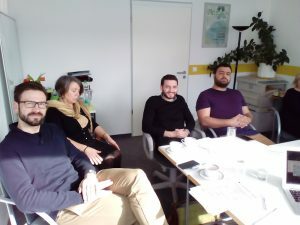 Our meeting started with an exchange on the project’s results. The coordinating partner presented the draft concept for teaching material on economic-political education. 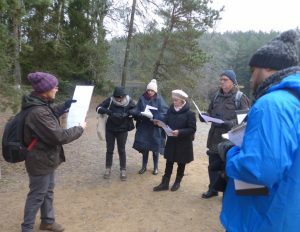 The Czech partner then provided an exercise on management skills for life which gave reference to their training sessions during the next teaching/training activities in Tartu/Estonia. The Estonian colleague also presented the draft programme of their training sessions on education for sustainable development. As the project’s focus lays on creative approaches to Economic Literacy, we also enjoyed games and exercises to stimulate creativity, connection and well-being. 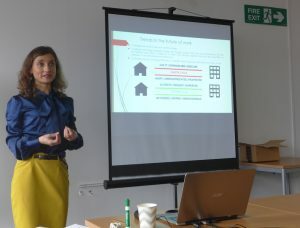 The second 5-days-workshop was provided by the hosting organisation, Peipsi Center for Transboundary Cooperation (Estonia), and EDUcentrum (Czech Republic). The workshop topics were Environmental Economics / Public Sector Economics and Management Skills for Life. The sessions on Environmental Economics introduced into this economic discipline and sensitized towards green aspects of economy and society. The aim of the management skills sessions was to reflect basic economic principles which may help adult learners to better understand how institutes of market economy work and how they (adult learners) can apply the economic literacy knowledge and skills to their own personal life situations. The overall objective was an exchange of good practise, thus providing learning experiences in terms of methods and themes. 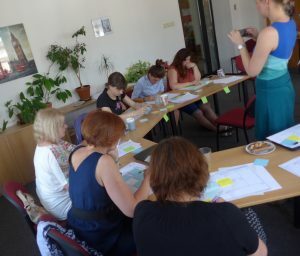 Back in Tartu, the group learned basic characteristics of a market. The Estonian partner, Aija Kosk, presented some crucial assumptions given by Adam Smith (1723-1790). For example, human beings are selfish and focus on their main chance, the basic idea of production and consumption is to raise the wealth of a society, the market can be considered as a self-regulating system. Through tasks and games the participants explored the main interest of enterprises (profit making) and households (wellbeing) and discussed different interpretations of welfare. The management part of the training (provided by EDUcentrum, the Czech partner) was dedicated to decision making and its pre-conditions as well as consequences in modern societies. 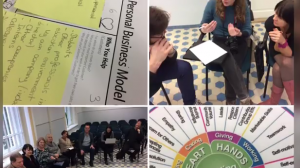 The main focus layed on the personal business model “Canvas” which was applied by each participant. The idea was to identify needed changes and to develop an action plan. 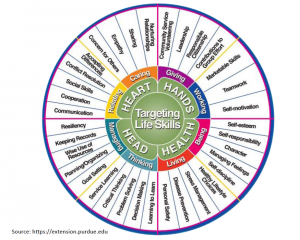 The model was embedded in the management skills for life concept. In particular those participants who work as coaches or in the field of counselling could benefit from these sessions (as trainers). The others enjoyed the model in terms of their own, personal prospects. Failures and fallacies occur in thinking economics. The final presentation gave a list of examples, e.g. in terms of risk avoidance and non-rational behaviour. At the end of each day and of the whole training was time given for methodological reflections. Which contents of the trainings can I apply in my educational context? How? The debate at the training’s end was made as a fish-bowl discussion to share this method either. The final meeting was dedicated to the project’s results, the common public event and management issues. Among others, we discussed and agreed on our developed concept of training material for socio-economic education in Europe. There is wide range of topics to be covered starting from behavioural economics to work 4.0, including growth, sustainability, social (in)justice, migration and economy, the Euro project, debts and guilts, the political economy of information, and others. We also completed our chapter of training material on the complex issue of industry / work 4.0. This theme was already part of our training activities in London when we exchanged methods to reach so-called disadvantaged learners. We face deep changes in the world of labour and the whole society due to the ‘digital revolution’. It raises several question, e.g. how to frame these developments politically and how can citizens (better) cope with complexity. A subject for citzenship and socio-economic education! Artificial Intelligence and Robots: Paradise Conditions at the Price of Submission? At the end of our ECOLIT project we have held a public event on the digitalisation of the economy and its impact on work and society as a whole. 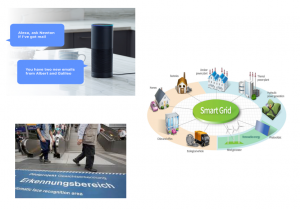 The use of robots, artificial intelligence and algorithm, the mass collection of data, etc. are going to revolutionise our societies. What changes are expected? What about the chances? What about the challenges? How should the digital change should be regulated by politics – in the world of labour? Would an unconditional basic income help overcoming social tensions due to high unemployment? What’s the role of socio-economic education in this context? 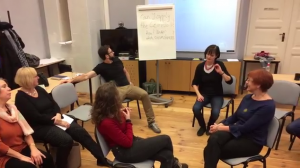 These and more questions were discussed at a lively and inspiring transnational encounter!